We can treat the most common foot conditions, click here to read more about how we can help. Learn more about common foot conditions, and how we can help you. We are here to help. But before we do, has your enquiry already been answered? 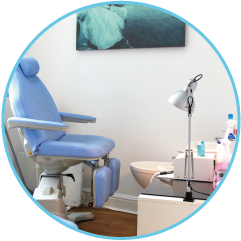 Stockport Chiropody Clinic is an established practice with over 7 years’ experience in providing the highest standard of comprehensive chiropody/podiatry care. You will be provided with tailored solutions that are absolutely specific to your needs as an individual. We have a wide variety of treatment options, So don’t be shy.